From a total of 1,025 entries, Ben Maya emerged triumphant in Event #43, claiming a World Series of Poker gold bracelet and the first-place prize of $257,764. Maya, who is a complete unknown in professional poker circles, overcame two tough 10-handed tables over the first two days on his way to this stunning result. On Day 2 at his table, he outlasted such luminaries as November Niner Vojtech Ruzicka and 888Poker Ambassador (and the biggest online tournament winner in history) Chris Moorman. Maya’s game was aggressive, unpredictable, and ultimately highly effective. He grew in confidence as the tournament progressed, and that belief and a dose of good fortune here and there ultimately saw him victorious. Maya was planning to fly out tomorrow but now says he will turn up in person for the bracelet ceremony on Monday to bask in the applause of the poker community — but most of all, to hear the Israeli National Anthem being played to celebrate his victory. Thomas Boivin limped the button, and Ben Maya raised to 280,000. Boivin moved all in, and once Maya was sure he had heard correctly, he called. The board ran out . Boivin’s rail was shouting for an ace, but the king on the flop was another blow to their man’s hopes. By the turn, it was all over. Boivin was gracious in defeat and had to settle for second place, while a tired Maya shocked himself and the tournament, with his first-ever WSOP cash ending up with a gold bracelet. Hand #178: Ben Maya limped the button, and Thomas Boivin raised to 200,000. Maya called, and the flop was . Boivin bet 275,000, and Maya called. The turn card was the , and both players checked. The river was the , Boivin bet 240,000, and Maya called. Boivin showed to get a pot back. Hand #179: Maya got a walk. Hand #180: A limped pot led to a flop of , and Boivin check-called a bet of 125,000 from Maya. The turn was the , and Boivin check-shoved and took another pot. Hand #165: Thomas Boivin completed, Ben Maya raised to 280,000, and Boivin folded. Hand #166: Maya completed, and Boivin opted to check. The flop was , and Boivin check-folded to a bet of 200,000 from Maya. Hand #167: Maya got a walk. Hand #168: Maya completed, and Boivin raised to 200,000. Maya asked how much Boivin still had and proceeded to put him all in. Boivin folded. 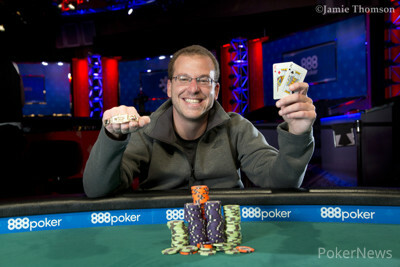 Hand #169: Boivin completed, and Maya opted to check. The flop was , Maya bet 100,000, and Boivin called. The turn was the , and Boivin check-called a bet of 240,000 from Maya. They both checked on the river. Maya showed for a rivered two pair. Boivin mucked. Hand #170: Boivin got a walk. Hand #171: Maya got a walk. Hand #172; Maya completed, and Boivin opted to check. The flop came , and Boivin check-called a bet of 100,000 from Maya. The turn gave them the . Boivin bet 200,000, and Maya folded. Hand #173: Boivin completed, and Maya opted to check. They checked it all the way down as the board ran out . Maya said he had five-high, and Boivin showed to win the pot. Hand #174: Maya completed, and Boivin checked. The flop came , and they both checked. Boivin check-folded when Maya bet 200,000 on the on the river. Hand #175: Boivin completed, and Maya checked. The flop came , and Maya check-called a bet of 80,000 from Boivin. The turn brought them the , and Maya check-folded to a bet of 245,000 from Boivin. Hand #176: Boivin got a walk. Hand #177: Boivin completed from the button, Maya raised to 380,000, and Boivin folded. Hand #162: Ben Maya limped the button, and Thomas Boivin checked his option. On the flop, Maya won the pot with a bet. Hand #163: Boivin limped the button, and Maya checked his option. They both checked to the turn of the board, where a bet of 200,000 won it for Maya. Hand #164: Maya limped, and Boivin checked his option. They checked it all the way down as the board ran out , and Boivin showed to win. Hand #154: Ben Maya limped, and Thomas Boivin checked his option. The flop was , and Boivin check-called a bet of 100,000. They both checked through the turn and river, and won it for Maya. Hand #155: Boivin opened to 125,000, and Maya called. The flop was , and Maya check-called a 125,000-chip bet. The turn was the , and a bet of 250,000 from Boivin took it down. Hand #156: Boivin got a walk. Hand #157: Moya limped and folded to a Boivin raise. Hand #160: Boivin limped, and Maya checked his option. They both checked all the way as the board ran out , and queen-high won for Maya. Hand #161: Boivin raised, and they saw a flop of , where Moya check-called a bet of 80,000. They both checked through the turn, and on the river, a bet of 105,000 from Boivin got picked off, as Moya called with to win. Hand #146: Ben Maya raised to 200,000, and Thomas Boivin folded. Hand #147: Boivin limped in, Maya raised to 260,000, and Boivin folded. Hand #148: Maya limped in, and Boivin opted to check. The flop came , and Boivin check-folded to the 100,000-chip bet of Maya. Hand #149: Boivin completed from the button, Maya raised to 210,000, and Boivin folded. Hand #150: Maya completed, and Boivin opted to check. They checked through the whole board. Maya showed , and Boivin mucked. Hand #151: Boivin raised to 100,000, and Maya called. They both checked on the flop. The came on the turn, Maya checked, Boivin bet 80,000, and Maya raised to 225,000. Boivin folded. Hand #152: Maya completed, and Boivin opted to check. The flop came , and Boivin check-folded to a bet of 60,000 from Maya. Hand #153: Boivin raised to 125,000, and Boivin called. They both checked on the flop. The turn gave them the , Maya bet 200,000, and Boivin called. They both checked on the river. Maya showed Boivin two spades for the missed flush draw, and Boivin showed to take the pot. Hand#140: Ben Maya completed the small blind, and Thomas Boivin raised to 200,000. Maya called, and they saw a flop of , where Maya took the pot with a 200,000-chip bet. 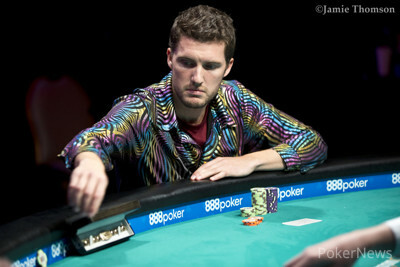 Hand #141: Boivon opened for 125,000 and folded to a 535,000-chip reraise from Maya. Hand #142: Maya limped, and Boivin checked. There was no further betting action as the board ran out , where the [78d2c] of Boivin won. Hand #143: Boivin opened for 125,000, and Maya called. The flop was , and Maya check-raised to take down the pot. Hand #144: Maya limped, and Boivin checked. They checked down to the river of the board reading , where Boivin bet 75,000 and got a call. Boivin won with . Hand #145: Boivin opened for his usual 125,000 at this level, and Maya called. The flop was . Maya check-called a 75,000-chip bet but folded to a 280,000-chip bet on the turn.